Stash game, on Sewing Mamas, started on Feb 1, but we've had HORRIBLE weather and been trapped at home for days. Awful. So, rather than sewing, I've been entertaining both boys in a super cold house in between tracing patterns and cutting stuff out. Yesterday, though, I got to sew! HURRAY!! Two Buzz Lightyear tees. I bought a couple yards of panels at Golden D'or during their last sale. .99/yd. Aldous picked it out, and I okayed it because it was cheap and I knew both boys would like tees with Buzz Lightyear on them. These are from the LaLaLa3 book: the tee pattern is pretty well-fitting for my skinny boys, not too boxy. so, not too long ago I read a "photography for crafters" blog post and one of the tips was to never photograph clothing lying flat because it looks weird. So that leaves options of a clothes horse, a model, or a mannequin. I'm taking the liberty of assuming a hanger is out of the question. And, to photograph in natural light. So, I finished these last night, then waited. I would have had my boys model them, but as it's -20 downstairs, they were already wearing 6 layers of clothes when we went down. So, the clothes horse it is, in natural light. I used my coverstitch machine for the hems! I'm getting better at it. Buzz Lightyear!! We had both Buzz Lightyear and Woody dolls for a couple of years, but the boys had never seen the movie. They called them "Astronaut" and "Big Tex". But, Doug bought them Toy Story a couple of months ago, so the honeymoon's over. Here's the 2T version, on the clothes horse and in natural light. Now this really IS weird. Silly William! that pink one wasn't the first one I had made, but I hadn't shared this blue one, altho I LOVE it!! 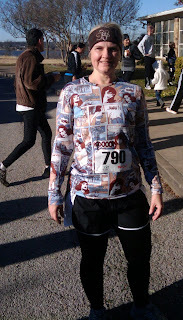 That's me after my dreadful first 10K. I can run a 10K with no problems now, and that was just a month ago. Weird. My muscles learned a lot that day, I guess. Anyway, the Jalie tee pattern makes a great running shirt because it's so great fitting. Thanks for looking! I think I got 23 points total for all this stuff. I guess the way it's going this year is cut one day, sew the next. I usually cut at night, sew during the day but it's not working like that for me this year.